Shall a Land be Born in One Day ? The blunt truth of it all is that the Jews have outsurvived the ancient : Assyrians, Babylonians, Egyptians, Persians, Greeks, Romans and everything and everyone else that Satan has thrown at them including the Vatican during the unholy inquisitions; neither the BDS movement, the Palestinian uprising nor the Prince of Persia shall prosper against it forever; for it is necessary for 'ALL' the : People's, Nations and King's of this planet who stand against Israel to also taste of the wrath of thee HOLY GOD of ISRAEL; there is justice in this Universe and GOD will 'NOT' allow any of Israel's enemies to prosper forever !!! This insignificant and unworthy servant of JESUS CHRIST RESURRECTED is very thankful to be allowed by GOD ALMIGHTY to be among a few students of Bible Prophecy to be chosen in this 'Final Generation' to witness EVENTS that Prophets such as : Isaiah, Daniel and Ezekiel as well as other Old Testament Prophets never had the opportunity to witness in their lifetime; ( Luke 10:24 ) even the Prophet Daniel did "NOT" fully comprehend the visions that he was to to write down and seal up; Mario Romano is very thankful that GOD trusts me with this ministry that now reaches all of : Central America, South America, North America and over 90+ other countries that visit us !!! The 4 Beasts that Daniel saw in dreams and visions we believe are being interpreted correctly by this vessel of GOD in this humble website; as well as its most likely 'Little Horn' as of this May of 2018, should Jesus Christ rapture His chosen within this decade !!! This student of Bible Prophecy and this humble website are no flukes ( product of sheer random luck ) the truth ( of which the Holy Spirit fully knows of*) is that this GOD fearing believer has literally invested 1,000's + of hours of : research, prayer and fasting through some 20+ years to get to this epic moment in world history. Although you may never see me on Youtube nor on any Bible Prophecy Conference, the important thing to me is that GOD my Creator and Redeemer knows and approves of this ministry. "IF" GOD one day wants to promote this His servant i'm available. ( In the meantime i plan to be faithful in this ONE thing that i believe GOD has entrusted me with*) This imperfect vessel of GOD just wants to give it his all with the one thing that I believe that HE has entrusted me with to in this moment in human history on this planet and I long to hear 'Well Done Good and Faithful Servant' when all is said and done !!! As this student of world history and Bible Prophecy meditates upon all the 90+ human generations that have preceded us since Adam and Eve and contemplate upon the rise and fall of virtually all of the Empires that have preceded us all; I stand in awe that it all comes down to us this 'Final Generation' that is being privileged to witness the 70th anniversary of the state of Israel and the recapture of Jerusalem in 1967 !!! The fate and destiny of this entire planet and its over 190+ countries and over 6.5+ billion human beings is literally directly interconnected with the very destiny of Israel !!! For half of my life I knew nothing about Bible Prophecy and of the plight of the Jewish people; it was only years after I became a born again Christian and studied the Holy Bible and its Prophecies that I came to understand that GOD through the Prophet Daniel revealed to us all that human history and especially Jewish/Hebrew history has a very clear ending point decreed by GOD ALMIGHTY. ( 70 Weeks are Decreed to your people and the Holy City... Daniel 9 : 24 ) In other words; we definitely do "NOT" have another 100 years of human governments !!! If you have read and studied the Old Testament you are very well aware that the ancient Kingdom of Judah was itself born of war. The ancient Hebrews/Israelites had to literally fight a motley crew of violent enemies such as the : Giants, Philistines, Amalekites, Canaanites, Edomites, Moabites, Ammonites, Midianites, Assyrians, Babylonians, Persians, Greeks and the Romans just to name a few !!! If you've observed the latest news you are well aware that Israel's enemies continue to grow to this day. While there are some 40+ Islamic countries on planet earth with Islamic Capitals 'MOST' Islamic nations are vehemently opposed to the very existence of one Jewish nation and its official capital : Jerusalem !!! According to Bible Prophecy 'MOST' nations on earth will turn against Israel during the Tribulation period 'NO' thanks in part to the diabolical Global PR stunt that the final endtimes Adolph Hitler ( Little Horn ) will perpetrate against the final generation of Jews. This 'NEUTRAL' student of world history and of the Middle East acknowledges that the State of Israel has the right to exist virtually "NO" nation has the right to condemn Israel's existence; as we study the history of Western nations and even those of Islamic countries we find them fighting for their very right to exist against Imperial/ Colonial powers as well as by numerous civil wars against themselves; the history of virtually most modern nations are full of : bloodshed, death and destruction !!! As a student of Bible Prophecy this servant of yours and of GOD fully understands that this planet and its corrupt and unholy governments have an expiration date; GOD is "NOT" going to allow human history to continue forever. Just this month a New York columnist asked his readers to imagine how the United States will look like in 10,000 years from now !!! When I read it, I felt pity for him because these United States is barely 240+ years and trillions of dollars in debt and neither the FED nor American Bankers, Stockbrokers nor any Financial Gurus show any real concern in directly addressing this epic challenge. You and I know that according to the Biblical endtimes scenario the United States will "NOT" be the world's last 'SUPER POWER' !!! As a student of world history this servant of yours has read numerous books and articles both : PRO and CON; concerning Israel's modern Independence in 1948; it is truly a MIRACLE that the Jewish people somehow managed to live and escape global persecution by some of the major world powers ( Spain Inquisitions, Russia Pogroms, Nazi Holocaust, Romans Destruction of Jerusalem, Slavery in Egypt, Babylonian Captivity etc...) So when this student of world history studies and considers the conflict between modern Israel/ its Jews and the 'Palestinian People' it is obvious that Satan has an almost endless number of volunteers to do his bidding. If you have been reading our articles you are well aware that Israel's greatest enemy of 'ALL' time is 'NOT' Islamic Armies; not even Russia and Putin to tell you the truth are prophesied to defeat Israel; Israel's greatest and final enemy will be an endtimes Western Power that is 'GUARANTEED' by the Biblical Prophecies to conquer most of the Mediterranean region and the Middle East just as the ancient Roman Empire the 4th Roman Beast of Daniel once did !!! Mario Romano specializes in the final 4th Roman Beast and that Beast has 'NO' : Chinese blood, Islamic blood nor Russian blood !!! This student of Bible Prophecy is in awe that he knows more about Israel's enemies and most of their major future actions than even : Prime Minister Netanyahu, Mossad, Shin Beth as well as other Israeli intelligence agencies. In 'NO' way do I gloat about it, in fact this student of Bible Prophecy is trying to 'INFORM' both believers and unbelievers of what is coming !!! Although it is true that most Jews living in the present and modern state of Israel on this May of 2018 are obviously not all practicing orthodox Jews; ( in fact the majority of Jews presently living in Israel are 'Traditional-Secular Jews' who do not really practice the faith of their fathers*) 'DESPITE' this truth; GOD still has divine plans with Israel and its Jews; GOD made promises to Abraham and to Moses concerning the Hebrew nation and HE is going to keep 'ALL' of His promises and make possible what to you and me may seen presently impossible and that is to spiritually open the eyes of 'One-Third' of the Jews and make them realize that Yeshua : Jesus Christ is the only true Messiah of Israel; GOD is going to use His 2 Witnesses and 144,000 Born Again Jews to make it all possible during the Tribulation period !!! 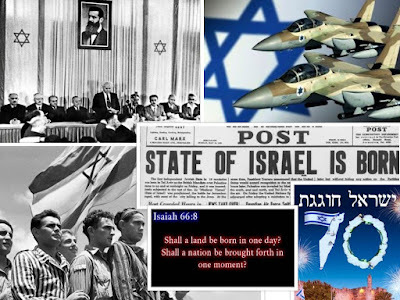 Yes, Israeli leaders have made various mistakes through these 70 years of Israel's existence 'BUT' "NO" neighboring people's nor countries are 'INNOCENT' before GOD the Creator of all. The truth of the matter is that the Islamic governments and Muslim leaders of : Egypt, Syria, Iraq and Iran just to name a few; have a terrible and bloody history of repressing and outright killing hundreds of thousands of its very own 'Islamic Brothers and Sisters' without Israel having anything to do with it all. This student of world history and human nature reminds everyone that Satan is most certainly behind the movement that is trying to brand Israel as an 'Apartheid State' the truth is that most if not all Islamic countries outrightly practice apartheid themselves; in Saudi Arabia it is no secret that Christianity and practicing Christians are outlawed, in Egypt, Syria and Iraq the vast majority of Christians have been horribly persecuted with little if any help from the 'Un-aparthied Practicing Islamic countries' that surround Israel !!! This 14 of May of 2018, also marks the official opening of the United States Embassy in Jerusalem. As a student of Bible Prophecy and Theology Mario Romano strongly believes that U.S. President Trump did the 'CORRECT' thing. 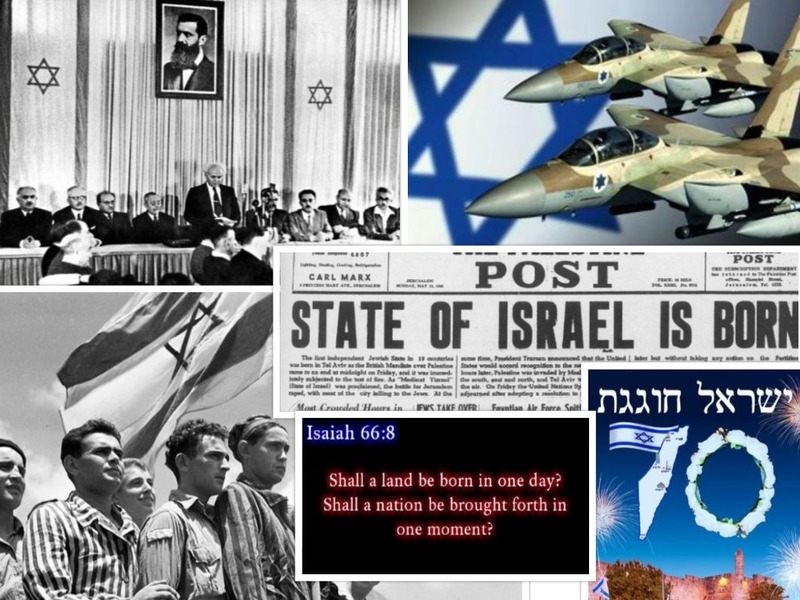 The nations that bless Israel shall be blessed 'PERIOD.' Obviously some 90%+ of the rest of the world including the European's led by Macron where "NOT" supportive of Mr.Trump's choice 'BUT' all of this is leading the entire planet were the Biblical Prophecies guaranteed to us all in the first place !!! This student of International Relations understands that some of our European visitors just can't understand why President Trump seems to be 'Going Against the Flow of International Diplomacy' and be against the : Paris Climate Accord, the Iranian Nuclear deal and moving the U.S. Embassy to Jerusalem too !!! The truth is that GOD gave this planet an EXPIRATION DATE and we are all seriously running out of time, GOD once used a donkey to accomplish His sovereign will and HE is definitely using Mr. Trump to accomplish His sovereign will DESPITE the opinions of the vast majority of world leaders. Presently, the USA Armed Forces dominate ( Air, land , sea, Space*) most of this planet and neither : China, Russia nor even the EU and much less the Islamic nations like this REALITY; unfortunately the days of the US global hegemony have been counted and decreed by GOD; this student of Bible Prophecy sees the 'Handwriting on the Wall.' The day and hour is coming when America will be unable to help the State of Israel; so I commend all that we can do TODAY to bless Israel and its people in ANY way !!! Unfortunately, numerous people will continue to die on both sides of the Israeli border for the ultimate destiny of Israel and its capital : Jerusalem. 'REMEMBER' this is a 'Spiritual War' there's more than meets the human eye at stake in this 'Spiritual Conflict' that has been going on for more than 2000+ years !!! The 'Blunt Truth' is that ancient Israel was born out of various battles and according to Prophets such as : Ezekiel, Zechariah and Daniel; the Battle of Armageddon will be fought in the the Valley of Jehoshephat in Israel !!! The Prophecies of Daniel 'Guarantee' that 'War will continue until the end' ( Daniel 9 : 26 ) As a human being created in the 'Image of GOD' it does sadden me that children and women will also continue to die in the clash between Palestinian's and Israeli forces 'BUT' this is nothing new, if you read the Old Testament you will find out that life and military conquest was even more brutal and deadly under the : Philistines, Assyrians and others who leveled and destroyed without mercy nor regarded any 'human rights' in war as we do today !!! The truth is that according to the Book of Revelation over 66%+ of the world's population will die during the Great Tribulation, we all live in a very violent world and the State of Israel and the Jewish people DO have the right to defend themselves against ANYONE who threatens to annihilate them as a people; be they : Palestinian's, Hamas, Hezbollah, ISIS, AL Qaeda, Erdogan, Iranian Mullah's or other Islamic diabolical clowns who allow themselves to be directed by the Prince of Darkness : Satan !!! 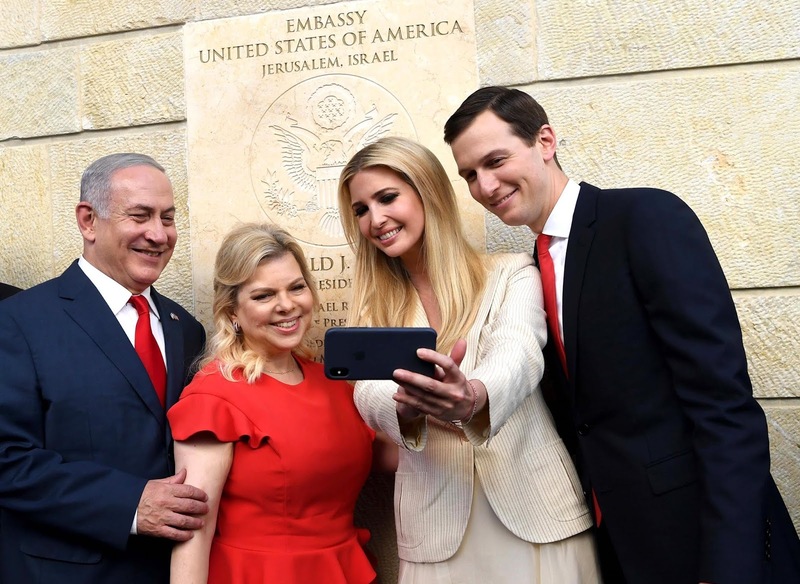 Although U.S. President Donald Trump did not personally attend the opening of the new American Embassy in Jerusalem he did send his daughter Ivanka Trump. Most social networks disparaged Ivanka celebrating in Jerusalem amidst the Gaza violence The truth is that this entire planet is full of violence; in Nigeria African blacks are killing their fellow black brothers, in Syria Muslims are killing Muslims en masse ( Mr. Erdogan the great hypocrite of Turkey who still denies the Armenian Genocide had the audacity to claim that Israel is committing genocide in Gaza; while at the same time negating that his people killed over : 1,200,000+ million Armenians one century ago !!! ) and unfortunately all through South America and Brazil and Mexico violence has almost exploded exponentially so much so that the governments there can no longer rely on the local police forces to keep 'law and order' and both Brazil and Mexico have been forced to deploy their armed forces onto the streets of their major cities to counter the growing : Kidnappings, Sky-rising killings, Narco gangs and growing lawlessness throughout their borders !!! The important thing to ask ourselves and consider as students of Bible Prophecy is what the Biblical Prophecies have to state about Palestinians and the future of all Islamic countries and people's including the 'Palestinians' according to the Biblical Prophecies there are 'ONLY' two types of human beings in the eyes of GOD; those who curse Israel and those who bless Israel; PERIOD !!! If the 'Palestinian' people and especially their past leaders ( as well as the present leadership ) would have accepted all the concessions that the Israeli government offered Yasser Arafat in previous 'Peace Talks' the 'Palestinian people' would not be in the situation that they are in; let's be honest Muslims don't want Jews living in the Middle East and if they had their chance they would have annihilated as many Jews as they could; Israel has a right to exist just as much as 40+ Islamic countries who oppress their own Islamic brothers and sisters and try to use Israel as a 'Scapegoat' for most of their national failures !!! This student of Bible Prophecy commends 'ALL' the aid and support that President Trump is offering to Israel because you and I know that the day and hour is 'RAPIDLY' approaching when that will 'NO' longer be possible as the first unholy and deceptive rider on the first horse of Revelation 6 is 'UNLEASHED' and not just against Israel but also upon a very 'Spiritually Blind' world. This student of Theology reminds everyone that the first horseman of the Apocalypse really won't care about either : Muslims nor Jews; he has his own diabolical agenda for the Middle East and the rest of the unsuspecting world !! !